I first heard about Ria Money Transfer from Overseas Filipino Workers in Geneva. Sending money to the Philippines was cheap, fast and safe through an agent. The OFWs knew the transfer charge and the amount to be received by their loved ones. They would get the money in one or two banking days. I was thrilled when I learned that OFWs in the United States can avail of this service online. Yes, you read that right. You can send money at the comfort of your home, office or anywhere with internet access. Sending money is no longer a hassle. Looking for agent locations near you is a thing of the past with this online service. It offers $0 fees for your first 30 days when you transfer money to the Philippines using your debit card. This is valid for first time senders only and it begins on the day you make the first transfer. With this promo, you do not need coupon codes to send money several times within the 30-day period for free! And the money reaches your family in minutes. There are three payment options which dictate transfer rates or fees. The first is using your debit card. Normal fee under this payment method, which means after the free 30-day period, is just $2 for $1,000 and below. And how much is the transfer fee for $1,000.01 and above? Nothing. Nada. Zero. You can also get this rate by using your bank account to pay for your transfer. Using your bank account will take up to four banking days. Why? Because Ria will make two small deposits in your account to confirm account ownership. No need to repeat this after the first transfer. The third payment option is using your credit card. This also takes minutes to process your money transfer like using debit card. Transfer rates are costlier though. Sending $100 and below costs you $8. And $100.01 - $250.00 costs $12, $250.01 - $500.00 costs $20! It must be a matter of a few dollars and an urgent need to use this method. You can send up to $2,999.99 per transfer per day and up to $7,999 in 30 days. Some states may have lower limits. Step 1. Go to Ria website in another window. Then come back here and we will go through the process together. The website is user-friendly so sending money will be easy and fast. Just get your contact information ready. Refer to the image to the left. Step 2. Enter the amount to send and you will see how much your recipient gets. You can also send US dollars to your recipient’s dollar bank account. Step 3. Choose the payment option: using your bank account, credit card or debit card. Your payment method affects the transfer fee. Use your debit card and bank account for free or $2. Using your credit card costs you a minimum of $8. Step 4. Choose the payout option: bank deposit, door-to-door or courier delivery, or cash pick up from more than 5,000 locations in the Philippines. The fastest method is cash pick or courier delivery which is within the same day. Step 5. Enter the first and last name of your recipient based on their government-issued ID. You also need to enter their email address or phone number for updates on the transfer. Bank deposit requires your recipient’s bank account number and routing number. Step 6. Sign up and fund the transfer. Enter your details based on your chosen payment method. This will make sending money to the Philippines easier! Ria will confirm your transfer through email. I was not able to send money to the Philippines through Ria because it only registers those living in the United States. But based on this review, sending money online has never been easier, faster and more secure through Ria money transfer. 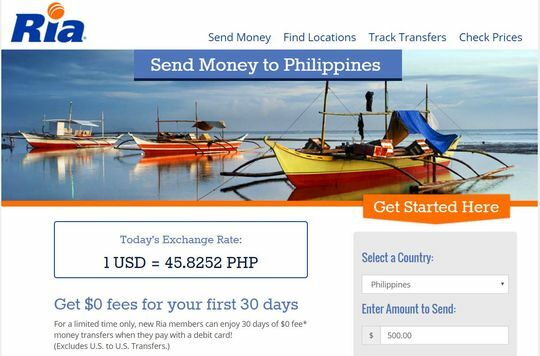 Start sending money transfer now to the Philippines through Ria Money Transfer!